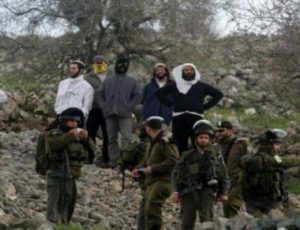 A group of extremist illegal Israeli colonists, squatting on Palestinian lands near Ramallah, in central West Bank, invaded Palestinian farmlands, Tuesday, and cut 550 trees and grapevines, owned by a Palestinian from Deir Jarir village, northeast of the city. The owner of the land, Abdul-Dayim Ajaj, said the Israeli assailants cut 400 grapevines, and 150 almond trees, which he planted in his land five years ago. Ajaj added that the colonists also wrote racist graffiti on the water tank he has on his land and fled the scene. Palestinian Minister, the head of the Colonization & Wall Resistance Commission, Walid Assaf, strongly denounced the attack, and added that it is part of repeated assaults and violations targeting that area. He stated that Deir Jarir and several surrounding villages are subject to constant violations by illegal colonists from Kokhav HaShahar outpost, which was built on private Palestinian lands. 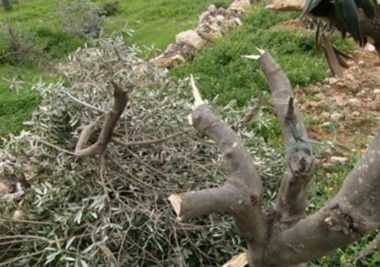 Assaf added that the Israeli assailants are also responsible for cutting hundreds of trees, burning Palestinian farmlands, attacking Palestinian farmers and shepherds, in addition to steeling and killing sheep and other livestock. He also stated that the names of the assailants are known to Israeli Police and the soldiers, but instead of apprehending and prosecuting them, the police is protecting them, and is constantly attacking the Palestinians who try to defend their lands.